At the national level there is an increase of 1487 CHCs in 2012 as compared to that existed in 2012. The number of allopathic Doctors at PHCs has increased from 20,308 in 2005 to 28,984 in 2012, which is about 42.7% increase. Along with 5858 Specialists, about 9911 General Duty Medical Officers (GDMOs) are also available at CHCs as on March, 2012. But, we think that it is important to take a closer look at these figures, examine the reality on the ground and understand peoples experiences regarding healthcare in rural areas. Therefore in the Summer of 2013, with the support of funds from Grand Challenges Canada, we launched a campaign tackling health issues in rural Jharkand. 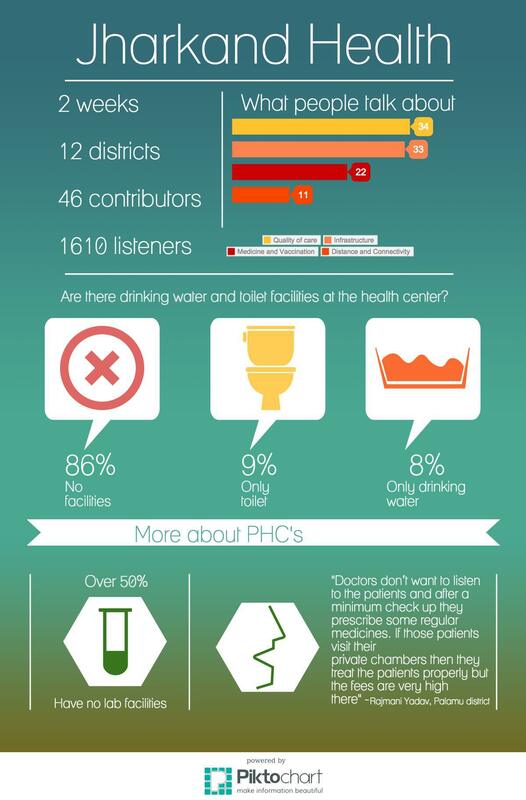 What are health facilities in Jharkand like? What issues do people face when seeking health services? In the process we hoped that by getting people talking about their experiences with health and healthcare we would create a space where citizens could demand greater government accountability. While conducting such a campaign one becomes painfully familiar with the difficulties in realistically generating government accountability among a marginalised population that suffer from multiple nodes of oppression. The fact that “accountability” is quickly slipping into meaningless development jargon only makes the situation more confusing. However, listening to the people speaking over our platform we found that understanding a situation from the ground up and creating space for conversations about healthcare issues can mobilise communities to demand accountability.